For just $5, you can buy a Christmas tree cutting permit and then you can choose and cut down your own Christmas tree in your National Forest. The mission of the USDA Forest Service is to sustain the health, diversity, and productivity of the nation’s forests and grasslands to meet the needs of present and future generations. To achieve this mission, they strive to protect and manage national forests so they best demonstrate the sustainable multiple-use management concept. One of these awesome multi-use management plans is providing American families with Christmas trees they can cut themselves. 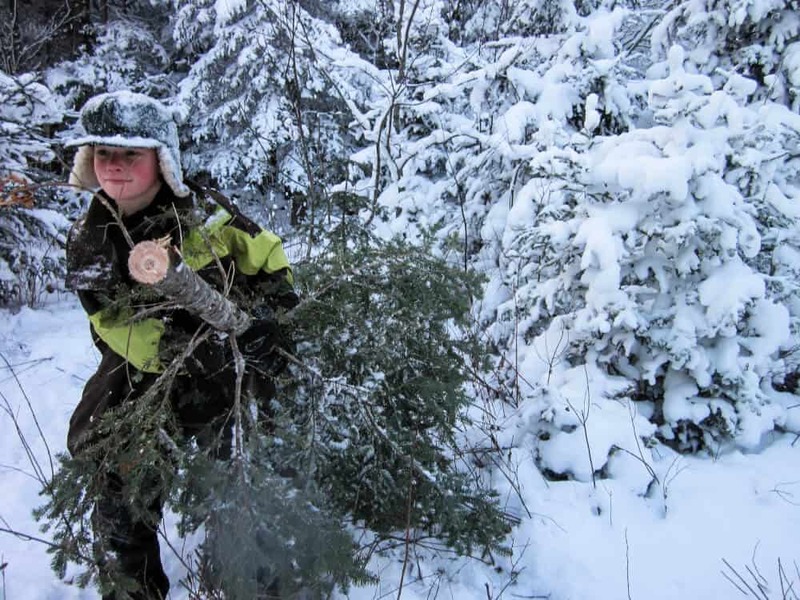 Get outside and cut down your own Christmas tree! 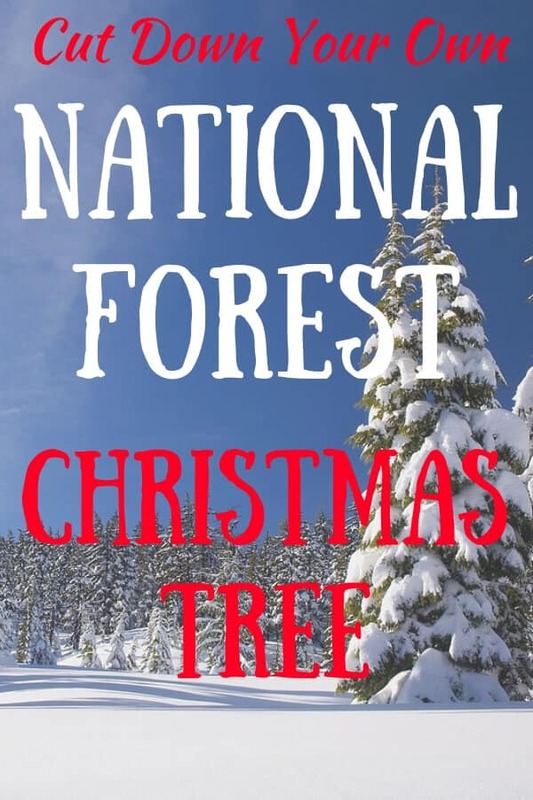 Most, but not all national forests will allow you to choose and cut down your own Christmas tree, but you must have a permit issued by the US Forest Service. The Christmas tree cutting permit is attached to your tree when you transport it home. How do you get a Christmas Tree Cutting Permit? To obtain your Christmas tree cutting permit, simply contact your local forest district office. If you live close enough, you can stop by and pick up your permit. If the office isn’t local, you can ask them to mail it to you. 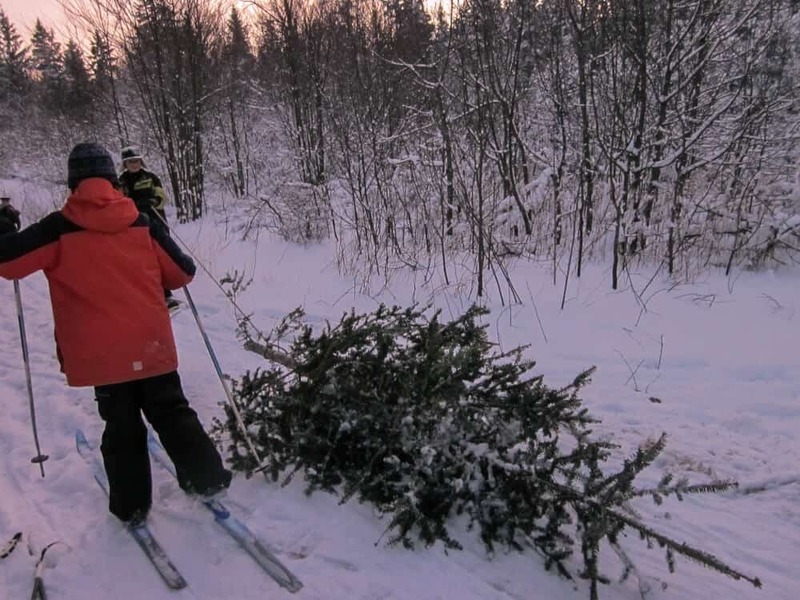 Specific tree-cutting guidelines can vary from forest to forest, but here are some general guidelines for cutting down your own Christmas tree in your national forest, taken directly from the US Forest Service website. Your Christmas tree is for personal use only. It can not be sold. You must have your Christmas tree cutting permit on you when choosing, cutting, and transporting your tree. 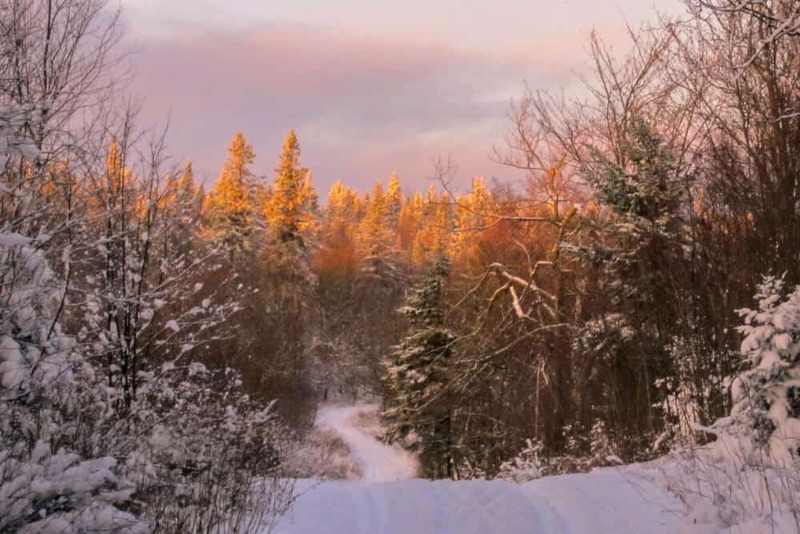 Your forest district office will be able to give you a map and accessibility options, and they can direct you to specific areas for cutting down your Christmas tree. Always check weather conditions and dress properly for winter activities in your national forest. Tell someone you know where you are going and when you’ll return. Check with local district offices before you cut dead or downed trees. Dead trees could provide animal habitat. Don’t cut any trees that are within 200 feet of rivers, streams, lakes, trails, and roads. Check with the ranger district for the proper distance. Select a tree with a trunk six inches or less in diameter, and prepare to cut down your tree no more than six inches above ground level. Never cut a tall tree just for the top. 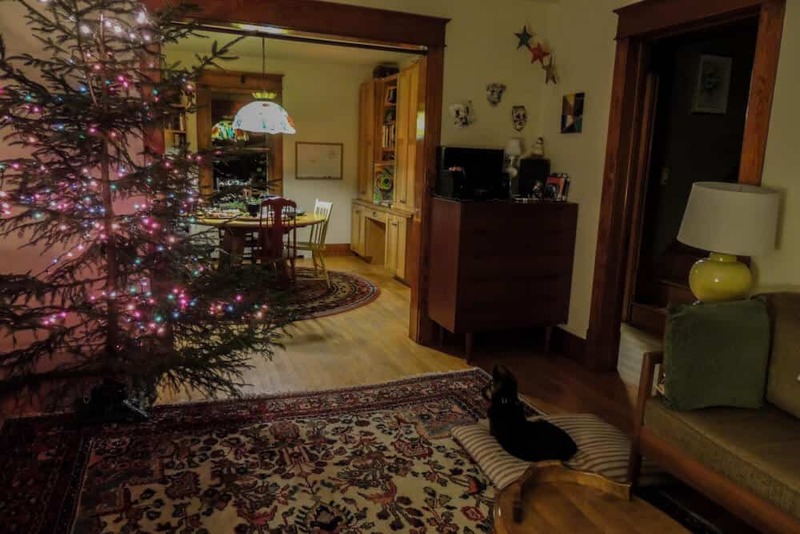 Select a Christmas tree from overstocked areas and thickets. Watch restricted areas. Cut only one Christmas tree per tag. Attach your Christmas tree cutting permit to harvested tree before placing in vehicle. Bring a rope and tarp to move your tree from the harvest area to your vehicle. Sometimes we get Charlie Brown Christmas trees that look a little scrawny when we get them into the house. Sometimes the front of the tree (the sunny side) is full and lush, while the back side is a little scraggly without many branches – all the better to fit into the little corners of our little house. Our Christmas trees are always beautifully wild, fresh, and completely unique, just like us. We usually choose a balsam fir, but occasionally we find a pretty spruce. Just depends on the year. Either way, they fill our home with Christmas fragrance and holiday cheer. The branches on our wild tree are spread farther apart than farm-raised trees, and there’s lots of room for ornaments. In fact, sometimes the ornaments take over the whole tree, but we love it anyway! Sometimes we ski our tree back to the car. I know that most people put their Christmas tree up right after Thanksgiving, but we always wait until Christmas Eve, when we celebrate with lots of food, music, and tree decorating. Our Christmas tree lives with us until January 6th, and then it spends the rest of the winter in the back yard as a hiding spot for the winter song birds. Come March, our tree is nice and dry, and it’s ready to be burned in our backyard maple syrup evaporator. Finding the perfect Christmas tree is an adventure, whether you go to the local tree farm or your national forest. Here are some tips for making your tree cutting day the best ever. Bring a saw, pruning shears, and lots of rope. A sled is really helpful if it’s snowy. Don’t forget your Christmas tree cutting permit. 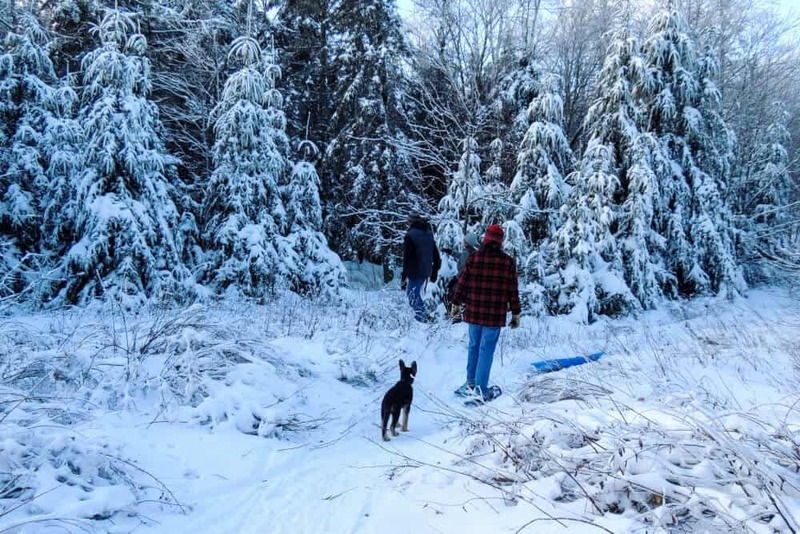 Remember that hiking into the woods is easy — hiking out with your Christmas tree is not. 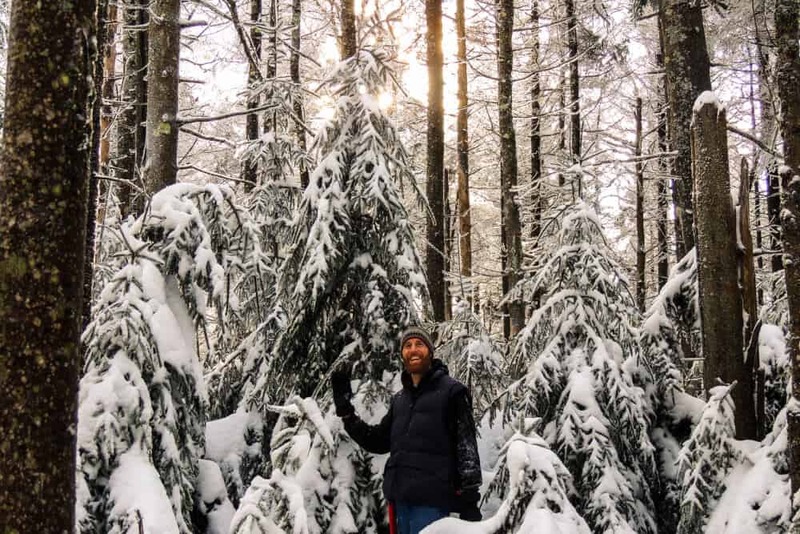 We try not to hike, ski, or snowshoe no farther than a mile looking for our perfect Christmas tree. The best day to cut down your own Christmas tree is one when the ground is covered in snow, but the trees aren’t. This way you can drag your tree back to the car on a sled, and you can ski or snowshoe into the forest. Bring hot chocolate to drink next to your chosen tree before you cut it. Or, better yet, whip up one of our favorite hot drinks for winter adventures. 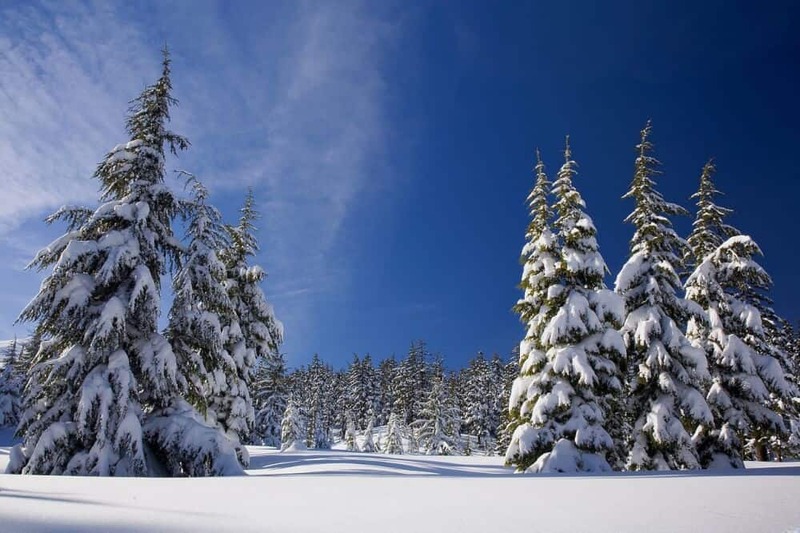 To find the fullest Christmas trees, look for a clearing that gets a decent amount of sun. To avoid arguments, let the kids choose the Christmas tree, and be happy with whatever they pick. They won’t be around forever you know. Do you cut down your own Christmas tree? I’d love to hear about your adventures in the comments below. Nite Ize CamJam Tie Down System – Such an easy way to tie down your Christmas tree to the top of your car. Choose from 6ft, 12ft, or 18ft. Tabor Tools Pruning Saw – A great portable hand saw for cutting down your own Christmas tree. Classic Stanley Thermos – This classic thermos is perfect for snowy hikes and Christmas tree hunting adventures. Such great information and helpful detail on how to go about doing this for the enjoyment of everyone in the family. Thank you for the post and the lovely photos as well. This is a popular tradition in CO – so much so that permits usually sell out by October! I always forget when it’s too late :(. But next year will be different! I’ve got a calendar reminder. Thanks for sharing! Oh wow, I had no idea, Meg. They’re always available here in Vermont. This is so cool! I didn’t know that you could do this. Our nearest national forest is in east Texas. Its truly amazing idea! I loved it & will try to do the same. Thanks for sharing Tara and Happy Christmas in advance! This is cool. We have a couple of National Forests near where I live. I’ll have to check this out. Thanks for the tip. Who knew you could cut down a tree from a national forest? Thanks for sharing, Tara! Ah, we don’t have real trees anymore, it’s such a shame. Live in Australia though, so not really the climate for traditional Christmas activities. I had no idea, either, that you could do this. What a fun family outing! 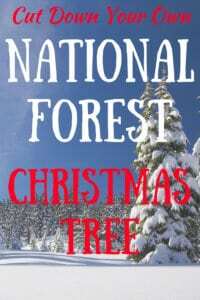 I had no idea that you could get a permit to get a Christmas tree out of a national forest, thanks for the information! Looks like you had a fun time finding your tree. Couldn’t help but think of Christmas Vacation while reading this. SQUIRREL!! Haha. What a cool concept! I love that you can walk out into the forest and chop down your own tree. BTW, your tree looks fantastic! Happy holidays!